Dom Steele Hartmann presided on 7 May at the election of Fr Sevanand Ennamprayil for a six-year term as the fourth Abbot of our daughter-house, Kurisumala, in Kerala, India. The Syro-Malankara Archbishop of Tiruvalla, Most Reverend Dr Thomas Mar Koorilos, conferred the official Blessing on Monday 14 May in the Ashram church. Dom Steele and Most Reverend Dr Samuel Mar Irenios, Bishop of Pathanamthitta were the concelebrants. Dom Sevanand was born in 1954 in Edoor, Kerala. He was a missionary priest, ordained in 1982, prior to joining the monastic community in 2012. He made his Cistercian solemn profession in 2017. Dom Ishananda Machiyanickal, who had been Abbot of Kurisumala since 2014, had reached the canonical age of retirement. Dom Eamon Fitzgerald, the Abbot General, with the consentof his Council accepted the resignation, effective from 15 April. The Tarrawarra community wishes Dom Ishanand a happy and fruitful retirement, and an abundance of blessings on Dom Sevenand and the Kurisumala community as they continue their Cistercian monastic journey. Since this happy occasion in May, Kerala has been through the tragedy of their worst floods in 100 years. Our men’s community, Kurisumala, is on top of a mountain so has been spared the flooding. The Cistercian women’s community at Kunnambetta, has experienced flooding on the property but, at the date of writing, the monastic buildings have been safe. Possible landslides remain a concern. The Sisters were urged to leave. However, in solidarity with their neighbours, they remained. Some of their families have suffered. Our prayers are with them. 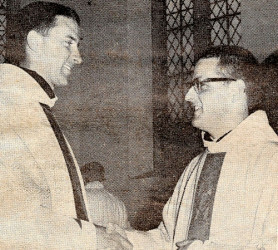 Fathers David Tomlins and Michael Casey celebrated fifty years of priesthood on 15 June. They were ordained in St Patrick’s Cathedral, Melbourne, by the then newly-appointed Archbishop, James Knox, who was later created a Cardinal and claimed back by Rome to head the Vatican department for Divine Worship. 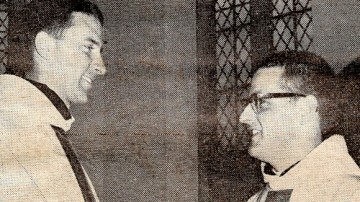 The Advocate, Melbourne’s Catholic newspaper back in 1968, reported at the time that Archbishop Knox revived an ancient Roman custom when, in his vestry, he bent and kissed the hands of the nine young priests whom he had just ordained. Six of the nine were from Corpus Christi College, Glen Waverley, the first diocesan priests to be ordained by Archbishop Knox since he came to Melbourne to take up his pastoral duties several months earlier. Another Advocate flashback: “Practically every seat in the Cathedral was occupied and scores of people in the front sections stood throughout the ceremonies, which occupied an hour and 50 minutes. Parents and relatives of the ordinands, diocesan and religious brothers and sisters were in the reserved seats”. Reserved they may have been but, on good authority we know that the Tomlins family camped in the Windsor Hotel almost across the road the night before and were at the cathedral doors when they opened in the morning, elbows poised like bargain hunters at the Boxing Day sales at department stores. The front seats fell to these sturdy, determined North Queensland legs that were the first to pound down the centre aisle. A choir of students from the Glen Waverley and Werribee seminaries sang Richard Connolly’s Mass, entitled ‘Give Us Peace’. The organist was Rev Simon Campion, SJ. David admits to wallowing in triumphalism in response to the augmenting instrumentalists, two trumpeters and a trombonist. “The exultant hymn, ‘Now Thank We All Our God’ was sung by the choir at the end of the ceremonies, after which the newly ordained were engaged for over half an hour individually blessing parents, relatives and friends”. Fifty years later, Michael celebrated the day in Rome where he was lecturing at a fiftieth anniversary symposium, “Prophecy and Renewal”, at San Anselmo University, commemorating the death of Thomas Merton in Bangkok. David was principal celebrant at the Tarrawarra Mass, which ended again with ‘Now Thank We All Our God’. And, of course, he cut the cake at the community evening meal. Among the many blessings he named was Vatican 2’s restoration of the concelebrated Mass which allowed monastic communities to enjoy a truly communal daily Eucharist as distinct from the multiple “private” Masses which had prevailed for centuries. Fr Michael Casey has been busily “spreading the word”, both by pen and power-point. 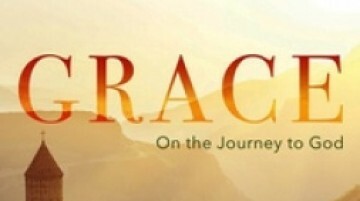 His book Grace: On the Journey to God, hailed as “this soon-tobe classic of the spiritual life”, appeared a couple of months ago. Bernard reports that it is selling like hot cakes in the Tarrawarra gift shop. No doubt that is typical of “other good outlets”. Michael approaches his subject in fifteen chapters. “The benevolence of God expresses itself in so many different ways as our journey unfolds”, he writes. “Gradually we come to realise that everything that happens in our life is somehow the gift of our loving Father. Occasionally this is apparent at the time, most often it happens in retrospect when the elements of wisdom are beginning to find a place in our hearts. 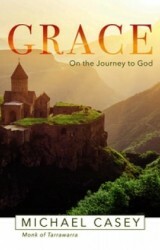 This is why I have included the word grace in the titles of all the chapters of this book”. Michael spent late May and June in the U.K. and Ireland lecturing and retreat-giving in some of our communities. He enjoyed a little island life when he headed a workshop for the junior Cistercian monks and nuns of the region held at the monastery on Caldey Island off the coast of Wales. Back home here at Tarrawarra, Michael has presented a series of three August Saturday afternoon lectures under the umbrella title “Thomas Merton (1915-1968): Spiritual Nomad”. The consecutive presentations were advertised as “The Journey to Abstraction”, “Uncovering the Deep Self”, and “Inner Experience and the Sense of Dread”. They were very well attended, averaging 60, and enthusiastically received. After the lectures, there was an invitation to “meet the monks” over a cuppa, and then join the community at Vespers. Those who had failed to find a seat in August were welcomed to an all-day affair on 1 September when the lectures were repeated. Again it was a “free” sell-out of sixty. Br Luke Rudd completed his Graduate Diploma in Library and Information Management in midyear. He had been able to pursue these studies online through Open Universities Australia, via Curtin University, Perth, over the past four years (2014-2018). Eight units were undertaken during the autumn and spring months of those years, leaving breathing space in-between for other things. There were three strands to the course – library, archives, and record management. Although Luke didn’t specifically study archives, he found what he did helpful to understanding his work in our archives. Luke considers that now is “a privileged time to be studying librarianship”. There has been a major evolution in libraries over the past half century with the advent of the Internet. The librarian is no longer just the custodian of books. Helping the user to help himself is a large part of the role. Luke sees “the challenge now as translating all that the course presented into what is appropriate, needful and life-giving for a monastic community whose focus is on lectio divina”. Congratulations, Luke. Luke can also claim another graduation in recent months. Early one wintry morning he was driving over the Christmas Hills when a kangaroo tried to thumb a lift with him on the bonnet. That left quite some repair work to be done. But Luke kept his cool and was able to continue on his way to pick up Michael at the airport. One of the community commented that such an encounter with a kangaroo is essential to one’s graduation as an Australian country driver. Public reading has always held an important place in monastic communities. The celebration of the liturgy, in the first place, meant that this would be so. Further, St Benedict devotes a chapter of his Rule to “the reader of the week”, stipulating that “reading will always accompany the meals of the brothers”, the reader being chosen according to his “ability to benefit the hearers”. The scriptures of both the Old and New Testaments, of course, are the source of many of the readings in the Mass and the Prayer of the Church. We encounter them repeatedly through the day in this context. The Fathers of the Church and other reliable and saintly authors down the centuries supplement the scriptures. Here at Tarrawarra we also listen to contemporary voices, especially in the Office of Vespers in the evening. Pope Francis’ apostolic exhortation On the Call to Holiness in Today’s World has provided inspiration in recent weeks. “The only great tragedy in life”, he reminded us, “is not to become a saint”. Holiness is not something esoteric and unattainable. “Very often it is a holiness found in our next-door neighbours, those who, living in our midst, reflect God’s presence”. Down-to-earth, as ever, he assures us that “this holiness to which the Lord calls you will grow through small gestures”. “At the centre is charity. St Paul says that what truly counts is ‘faith working through love’”. Francis insists that Jesus’ way to holiness cuts through the many precepts and prescriptions “to seeing two faces, that of the Father and that of our brother… or better yet, one alone: the face of God reflected in so many other faces”. After the public reading of such a document, one wants to re-read itprayerfully in private. Another worthwhile Vespers read has been New Wine in New Wineskins: The Consecrated Life and its Ongoing Challenges Since Vatican 2. It is amazing how many books we hear read over a lifetime of monastic midday meals. Audio books have provided this service of more recent years. They range across a variety of subjects. N.T. Wright’s St Paul: A Biography was our most recent enriching background to Barbara’s nourishing culinary courses. What a man! What a gift to us all! Prior to that we were off on a space station with Scott Kelly’s Endurance, his account of a year he spent out there contributing to science and the expansion of our physical boundaries. Candice Fleming took us into Russian history in The Romanov Family: Murder, Rebellion and the Fall of Imperial Russia. The family did not come across as a very attractive bunch, but one at last glimpsed some humanity when they had been pulled down from their thrones and were nearing their violent deaths. And then there was Anita Anand’s Sophia: Princess, Suffragette, Revolutionary, the biography of the spirited Indian Princess, a god-daughter of Queen Victoria, a privileged brat who eventually matured to become a battler for justice and equality. As we move through September, Kate Hennessy is giving us an intimate portrait of her grandmother in Dorothy Day: The World Will Be Saved By Beauty. Dorothy was a prominent American Catholic, writer, social activist, and co-founder of the Catholic Worker Movement. Her cause for beatification is in the pipe-line. Br Bernard Redden returned to us from Spain equipped with a “Compostela” (certificate of completion of the Camino pilgrimage to the shrine of St James), which states that he walked 799 kilometres between Saint Jean-Pied-dePort in France and Santiago de Compostela, Galicia, in 34 days, 14 June to 18 July. His “Credencial” (pilgrim’s passport) carries multiple stamps from the towns, churches and refugios or albergues (simple pilgrim hostels accommodating up to 90 in a dormitory) where he found a welcome bed (snores and the rustling of early departures, notwithstanding). Both documents deserve frames. Bernie chose the Camino as his way of taking a sabbatical after fifteen years as Prior of the community (spare Abbot), not to mention his leadership in choir as Cantor, and welcoming role as Guestmaster. The Camino is a network of pilgrim ways to the shrine of St James frequented since the eighth century. Up to a quarter of a million walk the Way each year. Bern travelled the most popular route, the Camino Frances. The first day was the big challenge, crossing the Pyrenees. He hasn’t mentioned Hilaire Belloc’s “fleas that tease in the high Pyrenees”! The Way led through Roncesvalles (of the epic poem, the Song of Roland, based on the battle there in 778) and cities such as Pamplona (no, he didn’t run with the bulls! ), Burgos, Leon. But rural Spain predominates: mountains and plains, forests, farmland and fields, bridges and canals, wind turbines, villages, and churches topped by storks’ nests. What remains in the memory? The community of those walking the Camino. And the fact that one walks the Camino to be empowered to return to the real camino of daily life with others back home. Australian Wind and Solar (AWS) installed 76 solar panels for us during the second half of April. This was a response to the community’s study of Pope Francis’ 2015 encyclical On Care For Our Common Home. For some years now we had been using two solar panels to pump our water from the Yarra, and a couple of other panels to power our electric fencing. The present project is more ambitious. It will not provide all of our energy requirements, but we hope to cut our power bills and do our little bit to save the planet. We opted not to use our roof space, but rather a small section of a paddock close to the monastic buildings. Of course, we moved straight into winter after the installation – cloudy skies and wild winds! Perhaps we should have become a wind farm! Fr Malachy Mara, Guestmaster at Tarrawarra for two decades, relished conducting groups of visitors on “grand tours” of parts of the monastery. His accompanying patter varied little from occasion to occasion. As he and his party hung over the fence to admire Fr Mark’s veggie garden, he would gesture south-easterly beyond the Yarra and announce: “Three hundred Aborigines are buried over there!” His reference was to Coranderrk, the former Aboriginal station on the outskirts of what later became Healesville. It is doubtful whether he, any of our community, or the general public, knew anything much of the Coranderrk story then. Ethel Shaw, who grew up there, during the 26 years her father was manager at Coranderrk, wrote her forty page account, Early Days Among the Aboriginals in the 1940s. The literature has slowly grown. Aldo Massola’s Coranderrk: A History of the Aboriginal Station appeared in 1975. Diane Barwick followed with Rebellion at Coranderrk in 1998. 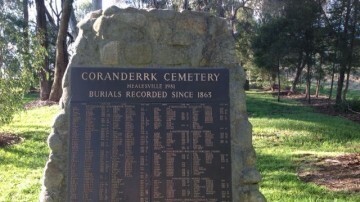 Giordano Nanni and Andrea James used the transcript of the 1881 Parliamentary Inquiry into Coranderrk to produce the verbatim play We Will Show the Country in 2013. The text is accompanied by valuable supporting biographical and historical material. The play has been performed in various places, including Coranderrk itself. Further material is to be found in Emily Fitzgerald’s Welcome to Wurundjeri Country: the Wurundjeri History of the Yarra (2014). Most recently Mick Woiwod’s passionate Barak Versus the Black Hats of Melbourne (2017) revealed more of the inspiring and tragic story as the Indigenous people struggled to hold on to the small remaining part of their ancestral lands against the dirty tricks of the Victorian Inculturation Society. Yes, there are 300 Aborigines buried there. The story? The 1835 arrival of John Batman and his party at Port Philip, his declaration “this is the place for a village”, and his “treaty” with the Indigenous Elders of the area, spelt the end of the life-style and culture of the five clans of the Kulin (Woiwurrung speaking) people and their occupancy of the land around the Bay and Yarra that had lasted tens of thousands of years. Lieutenant Governor La Trobe issued orders in 1842 banning Aboriginal people from Melbourne. By 1842, seven years after settlement, Victoria had been occupied by over 12,000 settlers, 100,000 cattle, and one and a half million sheep. Billibellary, the ngurungaeta or clan head, requested in 1843 that some land be reserved for the Woiwurrung clans. His request was refused. With the discovery of gold in 1851, the population skyrocketed. A Select Committee on Aborigines, in 1859, recommended the establishment of several reserves. Over the following years, six were set up: Framlingham, Lake Condah, Ebenezer, Ramahyuck, Lake Tyers and Coranderrk. Simon Wonga had succeeded his father Billibellary as ngurungaeta in 1846, and it was he who led a deputation of seven Wurundjeri (Yarra tribe) Elders to petition the Aboriginal Protector, William Thomas, to secure land for the Kulin at the junction of the Acheron and Goulburn rivers in 1859. Soon after this station had been established, Hugh Glass, the most powerful squatter in Victoria, had them removed from the Acheron to Mohican Station, a miserably cold site which had been abandoned because it was unsuitable for agriculture. A Central Board to Watch Over the Interests of Aborigines operated 1860-1869. John Green was appointed Inspector for the Central Board in 1861. Green was already a steadfast, trusted friend and supporter of the Aborigines. In 1863 Simon Wonga, William Barak (future ngurungaeta) and John Green led 40 Wurundjeri and Taungurong (Goulburn River), and Bunwarrung over the Black Spur to squat on a traditional camping site on Badger Creek. They petitioned the government for ownership. An area of 9.6 square kilometres was gazetted on 30 June 1863. It was called Coranderrk at the suggestion of the Aborigines. John Green, with his wife Mary, assumed management of the station without pay. There were about 100 at Coranderrk by 1866. The Government reserved another 2,500 acres for them on the site. They built a village and operated a very successful hop farm. In 1869 the Aboriginal Protection Act was passed and the Central Board was renamed The Board for the Protection of Aborigines (BPA). What had originally been a relatively benign relationship turned sour when the BPA, it seems, was infiltrated by members of the Victorian Inculturation Society who coveted the Coranderrk land for their own plans of introducing, for hunting purposes, all the European pests that subsequently ran wild. Green was harassed into offering his resignation as manager of Coranderrk, and a number of hopeless appointments followed. Tension and struggle ensued. In 1874 the Kulin began their protest against Green’s removal. Wonga died the next year and William Barak became ngurungaeta and spokesperson for the Coranderrk community. Barak led, on foot, a first deputation of seven from Coranderrk to the BPA’s Collins Street Offices in 1875. They were treated arrogantly and ordered back to Coranderrk. The following year a second deputation went to Parliament itself. After attempts to foil their visit, James MacPherson, the Chief Secretary (Premier), received them and reassured the deputation that there was no intention to remove them. A Royal Commission into the management was held in 1877, and a Parliamentary Inquiry in 1881. In 1881 Graham Berry, another sympathetic Chief Secretary, declared after a third deputation, “The Kulin shall not be removed”. He finally fulfilled the residents’ wishes by permanently reserving 4,850 acres. It was a short-lived victory. In 1886 the Aboriginal Protection Law Amendment passed both Houses and all “half castes” were required to leave the reserves. Around 60 were ejected from Coranderrk. Only 15 able-bodied men were left to work the hitherto successful hop gardens. Coranderrk reserve formally closed in 1924, though five older people refused to leave. A carload of the Tarrawarra community drove over to Coranderrk cemetery on 15 August 1978 to conduct a prayer service on the 75th anniversary of William Barak’s death. Dot Peters, a Healesville Aboriginal Elder, invited Dom David Tomlins, in late 1999, to be part of a small group that planned and prepared a prayer ceremony that combined Indigenous and Christian elements. This became the context for a Reconciliation celebration, BYO picnic with Coranderrk descendants, in Queen’s Park, Healesville, in March of 2000. 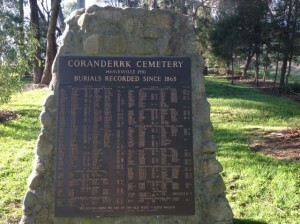 On 7 June 2011, Coranderrk was added to the Australian National Heritage List. 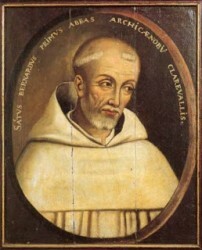 Today, we celebrate the life and work of St Bernard of Clairvaux, an abbot of our Order and a Doctor of the Church. 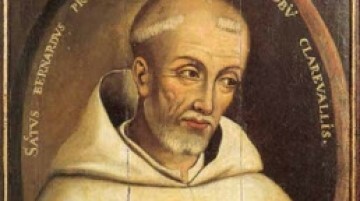 Bernard’s rule of life was simply the Cistercian way, and he gives what is perhaps the best short description of the Cistercian life in one of his letters (Letter 142): “Our Order is debasement, humility and voluntary poverty; it is obedience, joy and peace in the Holy Spirit. Our Order is to be under a master, under an abbot, under a rule, under discipline. Our Order is to be zealous for silence, to practise fasting, vigils, prayer, manual work and above all to keep to the more excellent way of charity. Moreover, it is a matter of making progress in all these from one day to the next, and to persevere in them until the final day.” Bernard is here sharing his own experience of the Cistercian life with us. In today’s Second Reading (Philippians 3:17 – 4:1), it is as if Bernard were saying to us: “Join with others in being imitators of me”. We can certainly imitate his way of love and his search for the Word. We know that our monasteries are schools of love. For Bernard, love is the ultimate goal because God is love. It is a spiritual path we are all called to follow. The Cistercian way of life is the answer to the prayer of Jesus to the Father in today’s Gospel (John 17:20- 26): “That the love with which you loved me may be in them, and so that I may be in them.” Since our monasteries are schools of love, there is a sense in which love is a learning experience. In one of his Sermons on the Song of Songs (Sermon 84), he addresses his monks and says to them: “Every soul among you who is seeking God should know that you have been anticipated by him and have been sought by him before you began to seek him.” We see the first step in the way of love is a reciprocal exchange of love. Here, God reveals himself. Based on his experience as a monk, Bernard had a profound knowledge of God. We heard in the First Reading (Ecclesiasticus 15:1-6) how a person prayed, and knowledge was given to that person; how a person pleaded, and the spirit of Wisdom came to that person. Likewise, Bernard made the search for Christ, the true Wisdom, the purpose of his whole life. His wisdom and understanding of God did not come from his intellectual gifts. Rather, it came from his own prayer life, and from the Holy Spirit moving within him. In his experience, it was the Spirit of love, who first came to him and gradually influenced him day by day, uniting him with the Word of the Father, and helping him to grow in understanding and union with God. Bernard also learned that God’s love for us is continual. If we are faithful in our vocation, our response also has to be continual. In another Sermon on the Song of Songs (Sermon 83), Bernard tells us what this response should be: “Of all the movements, sensations and feelings of the soul, love is the only one in which the creature can respond to the Creator and make some sort of similar return, however unequal it may be.” We are truly loving God with the love he has put into our hearts. Thus, we seek to grow in love daily. Our human weaknesses are not a hindrance to responding to God’s love for us. The real obstacle is putting up with our sins and making no effort to get rid of them. We easily displace God and give what properly belongs to him to something else. In this Mass, we will be sought and visited by the Word, who comes to us under the appearances of bread and wine. It is the same Word who came to Bernard and called him to the school of love. Let us welcome the Word into our lives and respond generously to his love. We cannot truly appreciate God’s love with divided hearts. As such, may we be detached from worldly fame and riches, and serve the Church with the same zeal and love which Bernard demonstrated during his life.